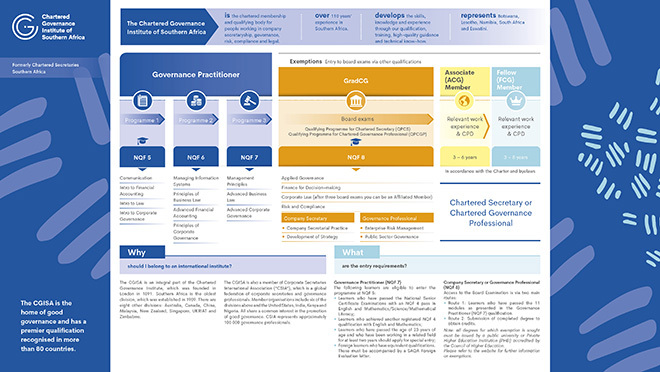 Chartered Secretaries Southern Africa is the formal professional Institute for the enabling of corporate governance and company secretaryship as well as the expert commentator and thought leader in Southern Africa on governance matters. It is a recognised qualification for the accounting officer post required in terms of Close Corporation legislation. CSSA is the professional qualifying body for Chartered Secretaries offering an international qualification recognised in more than 70 countries. The career-long programme of study comprises attainment of professional qualifications and requires continuing professional development (CPD), which ensures that members remain on the cutting edge of developments. CSSA represents Botswana, Lesotho, Namibia, South Africa and Swaziland. Chartered Secretaries are high-ranking professionals with a broad base of skills unique among the professions. Trained in governance, law, accounting, and strategy, Chartered Secretaries provide a focal point for independent advice and guidance on the conduct of business, governance and compliance. They are key players with the skills, vision and values to take their organisations and clients forward. Chartered Secretaries understand that good governance is fundamental to good business decision-making and organisational performance. Through our influence with Government and regulators, and the work of our Members, CSSA leads in shaping the governance agenda and promoting the best practice essential for organisational performance. Candidates who have completed the CSSA International Qualifying Board Examination, gained the necessary work experience and who present the requisite character traits will be qualified to apply to be admitted as a Member of CSSA and become a ‘Chartered Secretary’. Continuing Professional Development endeavours to ensure that all of our members are able to remain at the forefront of the governance and accounting talent pool. There is currently a shortage of qualified and experienced Chartered Secretaries, with demand on the increase in light of the new Companies Act (71/2008) and King 3. This means that Chartered Secretaries can command competitive remuneration packages. What career choices are there? Membership of CSSA evidences not only academic qualifications but also practical experience, character, integrity and responsibility. Only on fulfilment of all these criteria may a graduate apply to be admitted as a Member of the Institute and become a Chartered Secretary. There are two levels of membership - Associates (ACIS) and Fellows (FCIS). On successful completion of the CSSA Board Qualifying Examination, graduates immediately become GradICSA. Once they have gained the necessary practical experience and are deemed to be of appropriate ethical character, they are admitted as Members at Associate-level and become Chartered Secretary (ACIS). On admission as a Fellow, the senior grade of membership granted on more extensive experience, a Chartered Secretary may include the prestigious 'FCIS' designation after his/her name/title. Membership therefore offers employers 'watchdog' accountability with recourse to the Institute's disciplinary and disbarment proceedings in the case of misconduct and/or breach by a Member of the Institute Code of Professional Ethics and Conduct. Membership of the Institute ensures remaining at the forefront of global developments and best practice in governance. Membership, and therefore qualification as a Chartered Secretary, involves a career-long relationship with the Institute - from professional qualification through to board certification and beyond via CPD and ongoing technical support packages and tools. Is the qualification internationally recognised? CSSA is an integral part of the international Institute of Chartered Secretaries and Administrators, which was founded in London in 1891. Southern Africa is the oldest division which was established in 1909. There are seven other divisions: Australia, Canada, China, Malaysia, New Zealand, Singapore and Zimbabwe. CSSA is also a member of Corporate Secretaries International Association (CSIA), which is a global federation of corporate secretaries and governance professionals. Member organisations include the seven divisions above and the United States, India and Kenya. All share a common interest in the promotion of good governance. CSIA represents approximately 70,000 governance professionals.